This machine is a piece of trash. Bought it new from Home Depot. The tub fell off after 4 months. At 10-11 months it developed a leak that the service company says is due to bad shocks and a bad hose. Repair cost: $356.00. Neither Home Depot or LG will replace the washer. Use is an average of one load per week. 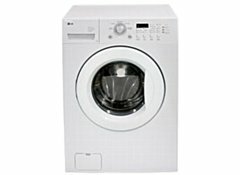 Do not buy an LG washer, you will be sorry. Thanks for the info. I will not purchase ANY appliances from this dealer nor will I purchase this bran LG now that I know how they treat their customers. INFURIATING !! I just bought Ray and Chris a washer and dryer. I got them Maytags which are made by Whirlpool. Mine are Whirlpool...They have never had a problem. They had great reviews. I've become a "reviews" shopper and never buy without reasearch. Thanks for sharing.